As Frank Herbert pointed out, beginnings are important. They are delicate time, times that must be approached with respect. I had been in Peru for a few days, long enough to allow what I believed would be an important experience to begin delicately. People were arriving on a daily basis, from around the world and around Peru. Jorge arrived at the hotel one morning with a small, wizened lady, an Inca elder. If character could be likened to ocean depth, this woman’s face reflected a depth of several thousand feet. Wisdom, humor, joy, and sorrow were all wrapped up in her eyes and her face was like a helicopter view of the Texas arroyos. In short, she was gorgeous. Not everyone was handling the altitude well. Some people reported headaches, deep fatigue, queasiness, shortness of breath, and an overall feeling of having been pummeled by an Inca warrior. A person or two needed oxygen fixes and I entered the hotel lobby one day to find a woman lying on a couch with an oxygen mask over her face and the tank next to her. I was incredulous at the sight of a few people puffing cigarettes in the courtyard and I was unable to fathom how one could manage the demands of the altitude with lungs caked in soot. Still, most people were cheerful, expectant, and hearty. As for expectations, I’d come with few. I knew I was meant to be there. My only expectation was to participate in and lend my personal energy to the solar disc activation in whatever way that would be of service to Jorge Luis, the Grand Mother of all lakes, Titicaca, and to humanity at large in whatever form it took right there in the moment. Having few expectations can be a beautiful thing. I’d already been thoroughly delighted by the beauty of the hotel and grounds, the sacred quality of the like, and the enchanting nature of things in general. I was about to be delighted further, but not just delighted—awe struck. The ceremonies began on Thursday, February 11, 2010. We gathered in a large hall. I had arrived with my friends and colleagues early enough to have a nice seat, close enough to feel a part of things but not so close that I risked falling into some shaman’s lap. And there were plenty of shamans’ laps one could fall into. Jorge Luis introduced the shaman who would kick things off with a sound invocation. He was from the Machu Picchu area, which had just suffered the worst flooding in many years, and had walked ten days to connect with others so he could make his way to Lake Titicaca and participate in the ceremonies. What a blessing that he was there! Using chant, drum, flute, music, and words he thrust from his mouth like arrows of intent, he invoked the divine with sound that vibrated walls, windows . . . and our hearts. Two colleagues in my group wore hearing aids and reported having very interesting (one would guess almost psychedelic) experiences. We were asked to close our eyes at some point and the sound was an earthy, heavenly chorus—no mamby pamby sweet angelic sounds, but the kind of powerful summoning that said, through music and deep, throaty voicings, the equivalent of, “Pachamama, Virachoca, Mother/Father God, we have heard you calling to us, the Children of the Sun, and we are here to answer that call.” It was transcendent, moving us from whatever dimension we thought we were in to having at least one foot in some parallel dimension that was primal and in which our hearts were cracked open. I was a different person when I opened my eyes and as I looked around, I could tell that others were too. It was good preparation for what was to come. We were all given three coca leaves, with which we were to make k’intus, little fan shaped arrangements of the leaves to use in ceremony. When the invocation was over, we filed outside to begin the fire ceremony. 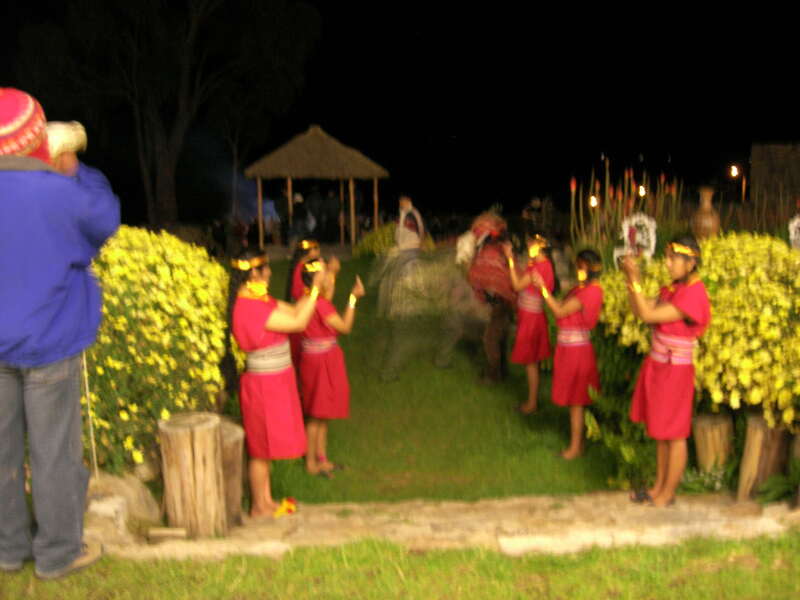 Young Peruvian women, dressed as Inca maidens or priestesses formed lines to the right and left of the path, and we stepped along as if passing through an energetic portal that blurred any sense of time. We might as easily have been those who came to Lake Titicaca five hundred years earlier, bearing the solar disc. My sense of it was that at least some of us actually were those people, returning now, as planned. A local shaman instructed us to breathe into our k’intus the intent to release whatever we felt we needed to release to the fire. We did so and tossed our k’intus into the fire. There were many of us and it was done prayerfully. It probably took a long time, but it’s hard to say. We were in a state outside of time. Then much hugging and singing and dancing. 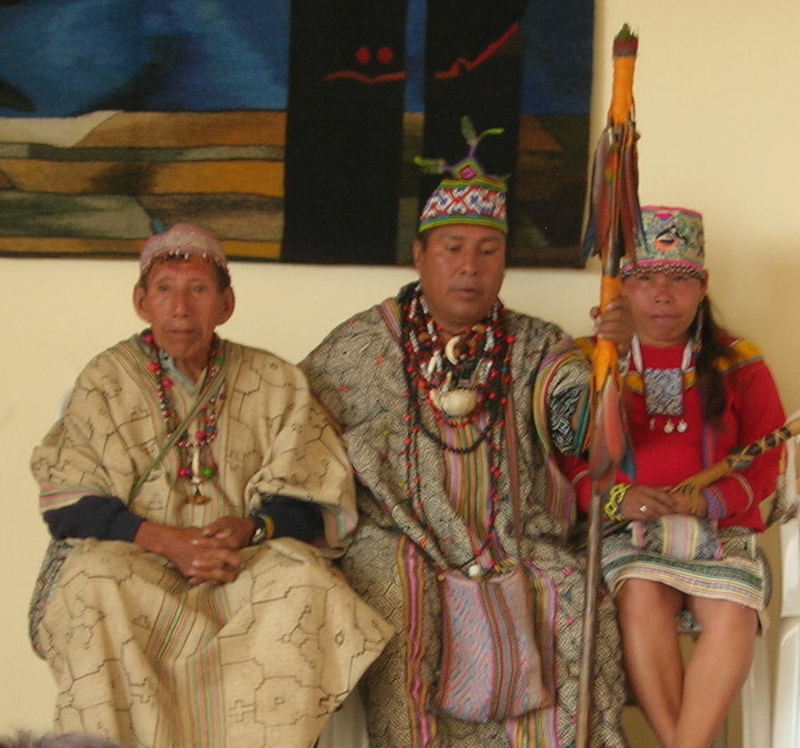 Shamans passed through the crowd offering personal blessings. I turned to find a shaman with a powerful, sweet force field right in front of me. He blessed me and I found myself dizzy for a moment. I heard someone refer to him as don Jesus and soon discovered that he was a shaman of the Amazon. He blessed my friend Lisa, too, and I joked that we had just been blessed by Jesus. One by one, those of us who desired it smudged ourselves in the smoke from the burning wood. I felt as if the best part of me had surfaced and that part of me was being hermetically sealed, right there on the top of the skin, not hidden deeply within where one would have to dig to find it. Back inside, we feasted. I had surrendered to sound and fire, had been purified by both, and was drifting between dimensions. I felt ready for whatever would come next.